More varmint zen with this glorious video of capybara hot tub hijinks. These clever creatures luxuriate in this spa-like setting all the live-long day, and have even trained their human servants to throw fresh fruit into the water on which to snack. Sweet! I heard or read somewhere that a prominent biologist said that if weasels weighed 65 pounds, there would be no other living mammals left on earth. Amazing! R.I.P., Bob Dorough, and thank you for making music that makes me smile. On Valentine's Day, a former student armed with guns murdered 17 people in a high school in Parkland, Florida. From March 2 through the 21st, a man sent home-made explosive devices to homes around the Austin area, killing two people and injuring five. Two days ago in Toronto, a man in a rental van ploughed along about a mile of pedestrian path, killing at least nine and injuring many more. What is the common thread running through all these stories, and how do they differ? Each one of these events was caused by a person who deliberately set out to kill as many people as possible. How they differ is the fact that many blame guns for the actions of the individual in Florida, but no one is protesting the manufacture and sale of the components of the home-grown explosive devices, and no one is screaming for more intensive screening processes for the rental of vans, either here or in Canada. The attacks in Austin and Toronto are a reminder that murder is caused by humans, and the method of delivery is really only a matter of semantics. So why are we bent about one method and not that bothered about the others, as a society? It is time that people focus on the real problem-- the human problem-- rather than the instrument of choice. The blog links will come back, but I won't have time to track them all back down until the semester is over and the dust settles somewhat. I am grateful to my dear friend Kim for sending me my images from the blog so they could be reinstalled, because for yonks just had advertising on my blog from the place that decided to hold my images hostage. I can't believe how quickly this semester has evaporated. I have a great deal of writing to do to complete my tasks, but it is mostly pleasurable writing, and I hope to get at least half of it completed this weekend. I am much occupied with a handful of papers I must complete in the next two weeks, but I do have a handful of specimens I need to get planted before summer's furnace arrives (I predict we'll see it by the end of May). We've already had a couple days in the 90s, one day reaching about 97. Ugh. Still, my sympathies to our neighbors up North and East who seem to have been more piled under snow this year than not. Count your blessings, because the rest of us appear to be marching resolutely back to drought status, we lucky few who emerged from drought for a couple years. 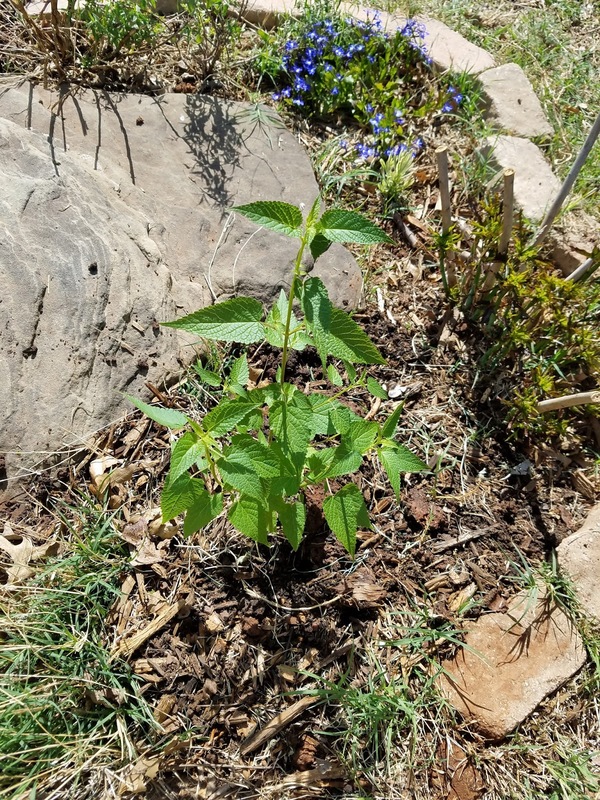 This morning I planted a bronze fennel at the front corner of one of my rock gardens (around a boulder in the ground), and at the back I planted a lovely specimen of Agastache rugosa called "Little Adder." I think it's also called Anise Hyssop, and it is a variety of hummingbird mint. They are water-thrifty and heat-hardy, and the hummingbirds love the nectar of their flowers. Doubly-delightful, they have the most beautiful flowery/minty fragrance. I have one established hummingbird mint of another variety, and I have two more specimen to plant in the next week. I also planted a beautiful phlox in front of the porch. My catmint is going bananas, so I'm cutting bits of it off and taking it to friends at school who have cats. It's a beautiful plant and has a lovely fragrance, too. My catmint is the Blue Wonder version, and it's beautiful. I'm thinking of planting a mess of it in another area, if I can figure out how to transplant new growth. 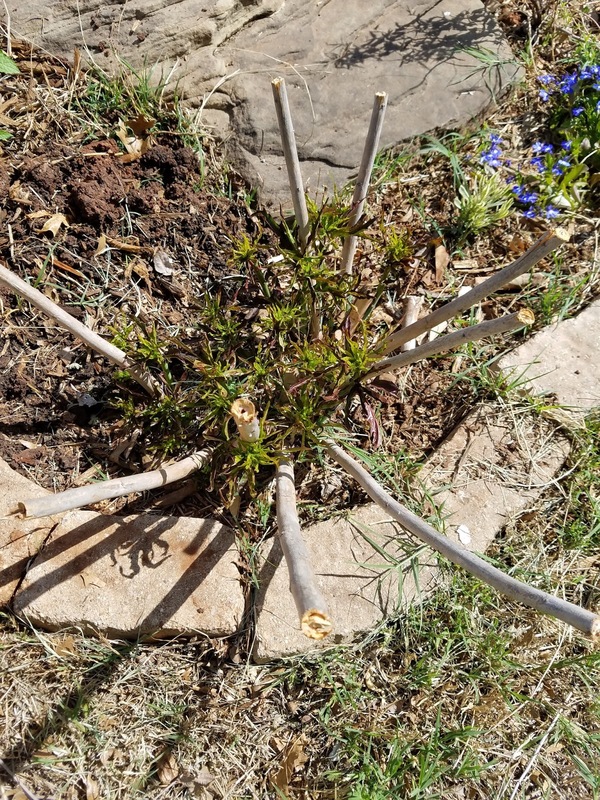 The new shoots are coming up on my Texas Star Hibiscus, and I am thrilled. Several perennials I planted last year have new growth coming in, and I can't wait to see how they do. Also, my Blue Glow Globe Thistle from High Country Gardens is looking lush and lovely, and I can't wait for its spectacular blooms this summer. 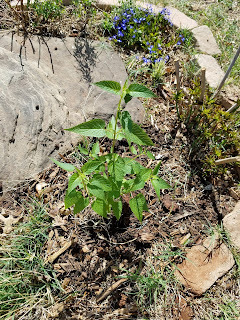 :) Also, High Country Gardens is a great resource for many varieties of Agastache (Hummingbird Mint), and that's where I obtained the specimen that I put in last year. I can't recommend High Country Gardens highly enough for their excellent specimens. Also, their website hosts a wealth of information on heat-hardy perennials with regional/zone breakdowns, and emphasis on plants for the particular pollinators you wish to attract (all of them!). 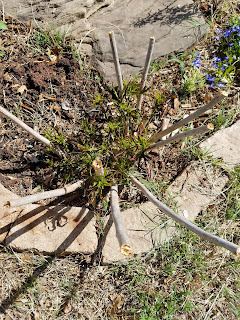 The upper photo is the new Agastache, and the lower one is the new shoots of Texas Star Hibiscus nestled among the canes from the previous year. Last year, there were about a dozen canes, and so far, I have counted over 30 canes of new growth. I'm leaving the other framework to protect the new shoots, since a neighbor runs their dogs through my yard. I'm just hoping I don't regret putting other new things in the area, because it's heartbreaking to toil over my flowers and then find they have been trampled. What's growing in your garden? Please comment if you'd like to share how your plantings are progressing so far this year.